One of the eight main columns of Saint Peter's Basilica facade, Vatican City. Modern column grid in a parking garage. A column in structural engineering is a vertical structural element that transmits, through compression, the weight of the structure above to other structural elements below. For the purpose of wind or earthquake engineering, columns may be designed to resist lateral forces. Columns are frequently used to support beams or arches on which the upper parts of walls or ceilings rest. 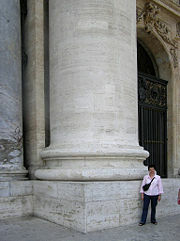 In architecture, column refers to such a structural element that also has certain proportional and decorative features. A column might not support any major structure but be a decorative or triumphant feature with, for instance, a statue on top. In the architecture of ancient Egypt, as early as 2600 B.C.E., the architect Imhotep made use of stone columns whose surface was carved to reflect the organic form of bundled reeds; in later Egyptian architecture faceted cylinders were also common. Some of the most elaborate columns in the ancient world were those of Persia especially the massive stone columns erected in Persepolis. They included double-bull structures in their capitals. The Hall of Hundred Columns at Persepolis, measuring 70 × 70 meters was built by the Achaemenid king Darius I (524–486 B.C.E.). Many of the ancient Persian columns are standing, some being more than 30 meters tall. The impost (or pier) is the topmost member of a column. The bottom-most part of the arch, called the springing, rests on the impost. Early columns were constructed of stone, some out of a single piece of stone, usually by turning on a lathe-like apparatus. Single-piece columns are among the heaviest stones used in architecture. Other stone columns are created out of multiple sections of stone, mortared or dry-fit together. In many classical sites, sectioned columns were carved with a center hole or depression so that they could be pegged together, using stone or metal pins. The design of most classical columns incorporates entasis (the inclusion of a slight outward curve in the sides) plus a reduction in diameter along the height of the column, so that the top is as little as 83 percent of the bottom diameter. This reduction mimics the parallax effects which the eye expects to see, and tends to make columns look taller and straighter than they are while entasis adds to that effect. Modern columns are constructed out of steel, poured or precast concrete, or brick. They may then be clad in an architectural covering (or veneer), or left bare. 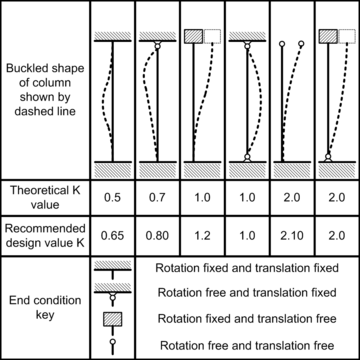 Table showing values of K for structural columns of various end conditions (adapted from Manual of Steel Construction, 8th edition, American Institute of Steel Construction, Table C1.8.1). 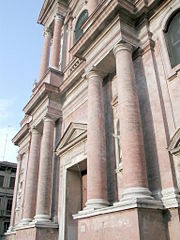 Church of San Prospero, Reggio Emilia, Italy. The Greek Doric, developed in the western Dorian region of Greece, is the heaviest and most massive of the orders. It rises from the stylobate without any base; it is from four to six times as tall as its diameter; it has twenty broad flutes; the capital consists simply of a banded necking swelling out into a smooth echinus, which carries a flat square abacus; the Doric entablature is also the heaviest, being about one-fourth the height column. The Greek Doric order was not used after c. 100 B.C.E. until its “rediscovery” in the mid-eighteenth century. The Ionic column is considerably more complex than the Doric or Tuscan. It usually has a base and the shaft is often fluted (it has grooves carved up its length). On the top is a capital in the characteristic shape of a scroll, called a volute, or scroll, at the four corners. The height-to-thickness ratio is around 9:1. Due to the more refined proportions and scroll capitals, the Ionic column is sometimes associated with academic buildings. The Corinthian order is named for the Greek city-state of Corinth, to which it was connected in the period. 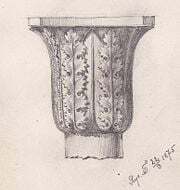 However, according to the Greek architectural historian Vitruvius, the column was created by the sculptor Callimachus, probably an Athenian, who drew acanthus leaves growing around a votive basket. In fact, the oldest known Corinthian capital was found in Bassae, dated at 427 B.C.E. It is sometimes called the feminine order because it is on the top level of the Colosseum and holding up the least weight, and also has the slenderest ratio of thickness to height. Height to width ratio is about 10:1. Solomonic columns were inventions of Baroque architects in Europe. They were not used in antiquity, but were called “Solomonic” by baroque architects because they were based on a description of columns in the great temple of King Solomon in the Old Testament. A Solomonic column begins on a base and ends in a capital, just like a classical column, but the shaft twists around the usual parameters of a column, producing a dramatic, serpentine effect of movement. The most famous use of Solomonic columns is in the baldocchino designed by Bernini for Saint Peter’s Basilica in the Vatican City. Curl, James Stevens. 2003. Classical Architecture: An Introduction to Its Vocabulary and Essentials, with a Select Glossary of Terms. New York: Norton. ISBN 0393731197. Harbeson, John F. 2008. The Study of Architectural Design: With Special Reference to the Program of the Beaux-Arts Institute of Design. The classical America series in art and architecture. New York: W.W. Norton. ISBN 978-0393731286. Semes, Steven W. 2004. The Architecture of the Classical Interior. The classical America series in art and architecture. New York: W.W. Norton. ISBN 0393730751. This page was last modified on 31 December 2008, at 16:01.